Sigh. There’s so much wrong with this story. First, we have a “prophet” by the name of Penuel Mnguni who lived in Soshanguve, Pretoria. He claims to turn rocks into bread and… snakes into chocolate. Here are some (truly awful) pics. You’ve been warned. 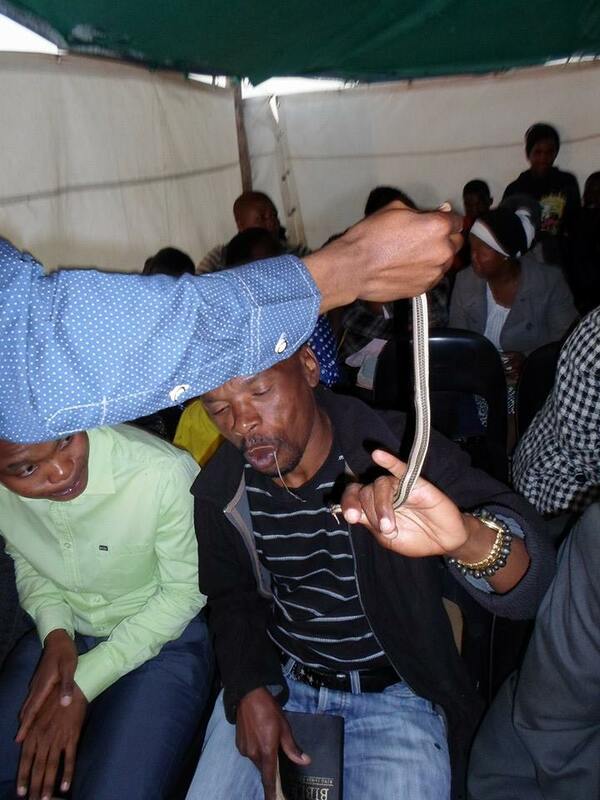 In May, Mnguni, 24, was in the news with reports that he claimed to have turned members of his congregation into snakes. In the past, he’d asked his congregation members to strip because… who knows. He caused the “power of god” to turn a guy into a horse. Then he rode the “horse” around. He also jumps on top of people. Claims they can’t feel it because… again, who knows? So, what do you suppose is up with that congregation? I can’t help but wonder how he gets all these people sold on the notion of eating raw, living snakes. What kind of persuasive power do you have to physically jump on top of someone else without prompting copious complaints? Is this an educational issue? Superstition? Mass hysteria? Does he promise riches? Escape from hell? Tremendous social support? There’s a bit of good news in this story. Looks like a group called “Economic Freedom Fighters” burned down Mnguni’s tent/church. Earlier irate members of the community and EFF members stormed the church, where congregants have in recent weeks reportedly been fed snakes and rats by their pastor, Penuel Mnguni. Last month Mnguni was arrested and charged with animal cruelty after the SPCA laid a complaint. At the time the animal rights body said the practice of feeding rodents and snakes to congregants were traumatic to children who attended his church sermons. Minutes later the huge tent was set alight. Police were called but by the time they arrived, the tent had burnt to the ground. A police officer was heard asking a congregant where the pastor was and he was told “he’s long gone”. Before the marquee was burned down pastor Mnguni had been very actively preparing for the service. He also issued a stern warning to what he called “other mushrooming pastors” that they will not be allowed in the townships anymore. While I’m glad that Mnguni is long gone, I feel bad for the next group of gullible people who will fall prey to his scheme. Here’s his Facebook page. Lots of odd stuff there. Enjoy. The next group of gullible people? They’re what we call “believers”. So-called “Wonder-working” preachers are not uncommon. 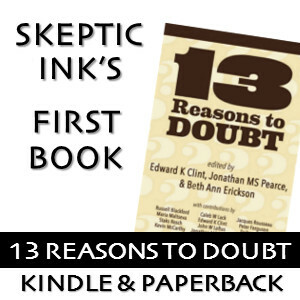 Every single one claimed to heal the sick, raise the dead, turn snakes into chocolate —NO! I mean turn water into wine, drive out demons … all kinds of wonders. This was such a necessity for the resume of any itinerant preacher that even if you were writing decades later about a fictional one, you had to include those “wonders” as part of his repertoire. Sometimes these claims were augmented with actual stage magic tricks. Duping that naive population was hardly difficult. Like the culture the guy in this article is living in, everyone was already primed to believe it. They all believe that magic and miracles are true in general, so claiming that “Here is a specific example” is no leap. The difference, of course, it that science is unique in that it can demonstrate its facts to anyone and everyone who cares to look. The greatest problem is that for most citizens, their educations have not been sufficient to let them really realize that unique aspect of science. As a result, they think “science” is the list of astounding claims in their high school text book: The speed of light! Photosynthesis! How planes fly! Their lived experience is that the claims of science are not psychologically different from the claims of wonder-working rabbis, so they may or may not just on mere faith believe or not that vaccination is bad and weight-loss pills really work. Or that new drugs are safe and effective.